Richard Shandon and Dr. Clawbonny both receive letters from an unknown party inviting them to accompany an expedition, the destination unknown. Shandon as the chief officer is also empowered to assemble the crew and pay for the construction of the ship for this adventure, the Forward. The completed ship receives its orders, to go north towards Melville Bay. The ship heads north, but as of yet the Captain has not made his appearance. 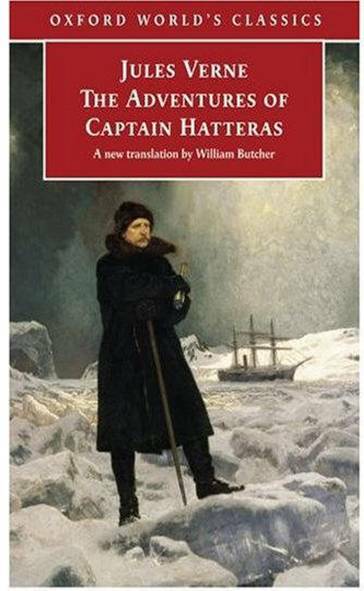 Eventually a member of the crew reveals himself to be Captain John Hatteras. And his goal is for their British crew to be the first to reach the North Pole. When things don’t go as Hatteras thought they would, the crew (including Shandon) mutinies and destroys the ship. This occurs while Hatteras and others are attempting to find supplies that might have been left behind by a previous expedition; instead they only find the one survivor of an American expedition. Finding the ship destroyed upon their return, Hatteras, Clawbonny and remaining crew makes a boat out of the ships remains and continue in their attempt to reach the pole. Translator & Critical Material: William Butcher. The World’s Classics. Oxford & NY: Oxford University Press, 2005. 448 pages. There are no known reviews by any of our members of this edition, but this edition was translated with critical materials by member William Butcher.